At SouthShore Nissan, we know auto body work is generally some people don't want to think about. That's because it usually means a vehicle is in need of some big repairs to its frame, either from a collision, or something else. However, we're here to make that experience as positive as possible, and do so with our dedicated team auto repair specialists. Our team will bring your vehicle, no matter the make, model, or brand, back to its pre-accident state, and provide services like free towing to our collision center, lending you a loaner vehicle, and managing 100% of your claim, while we assess the damage, and work hard to get your vehicle back and running in tip-top shape. When working on vehicles to bring them back to standard after a collision takes a lot of work, but when you have the right tools, like we do here in our auto body shop, it makes the job easier, and we're always successful because of it. In addition to all the tools and technology we have technicians here who are highly trained in their disciplines, with ASE and iCar Gold Class certifications, the highest classification an auto body repair tech can have. With the right tools and the right people, you can be sure your vehicle will be fixed as we have what we need to make it happen. In our Amityville, NY location, we promise to do a job well done, so you'll always feel like we've exceeded your expectations. This is just the way we do things around here, and our goal to deliver on our promises is important. We hope to turn a situation that can be stressful into one that you'll come out of feeling very positive, and it's all because the quality and commitment of our work. That quality extends throughout our service center as well, as we can provide all vehicles, regardless of make or model with oil changes, and wheel alignments, along with finding you the right set of tires in our tire shop in the Long Island area. 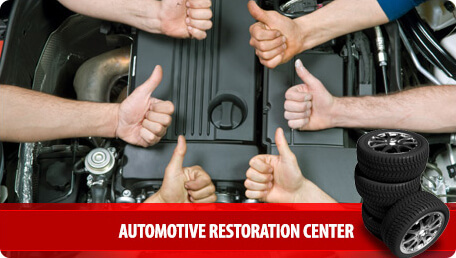 When we say we want to restore your vehicle to 100% pre-loss condition, we mean it. That also means Unrelated Damage Forgiveness. Those bumps, nicks, and scratches that your vehicle has accumulated prior to your collision, so the vehicle will be good as new. We figure if it needs to be restored, why not truly restore it? Again, another way we go the distance for you. Here at our auto body shop, we fully assess your vehicle and determine what needs to be done. We want to make sure you are entitled to everything your insurance company offers you, and use only the finest auto parts and accessories. To ensure this happens, we can negotiate your claim, with your permission. We have years of experience in the industry getting the best for our customers, and we want get your vehicle back to 100% per-loss condition, which is why we offer this service to you, showing our full commitment. Your vehicle is going to be looking good when we're done with it, and that includes a shiny exterior, and clean interior. We detail all vehicles that come in to our auto body shop, providing waxing, polishing, window treatment, tire dressing and touch up paint on the exterior, and a vacuuming of the interior, and shampooing of carpets. It's going to feel like you're getting a brand new car back, with all the familiarity of your current vehicle. A car is a big part of your daily life, and to go without one while it is being repaired can be tough. Fear not, however, because at SouthShore Nissan we will provide you with a loaner vehicle to drive while we repair yours. We also will tow your vehicle to our body shop free of charge, and get working on it as soon as we can, and give you a ride home if it is late at night. Within 24 hours, we start working on vehicles. There's no convenient time for a collision, but we make sure to convenience you every step of the way. Call the SouthShore Nissan Collision Center. We will tow you in, contact your insurance company and begin managing your claim immediately.